This article is about the herb; the tree Agonis flexuosa is also commonly known as peppermint. Peppermint is an aromatic, usually sterile, natural hybrid plant (Mentha × piperita) that is a cross between watermint (Mentha aquatica) and spearmint (Mentha spicata) and that spreads by rooting. The term also refers to the oil from this plant that is popular both as a flavoring agent and for medicinal purposes. Peppermint generally is generally regarded as "the world's oldest medicine," with archaeological evidence placing its use at least as far back as Ancient Egyptian times. Peppermint is a well-known example of a plant that offers numerous values to improve the quality of human life. Its medicinal uses including treating ailments of the respiratory, digestive, circulatory, integumentary, and nervous system. Human creativity has developed numerous commercial uses for peppermint, including using in tea, toothpaste, ice cream, candy, and cosmetics. In addition, peppermint offers ecological values, including providing nectar for organisms such as honeybees. Mentha x piperita is a perennial plant that grows to a height of up to one meter (three feet) (Longe 2005). Typically the stems are from 30-70 centimeters (cm) tall, rarely up to 100 cm, smooth, and square in cross section. Peppermint has small purple or white flowers and downy green leaves with serrated edges. The leaves are from 4-9 cm long and 1.5-4 cm broad, dark green with reddish veins, and with an acute apex and coarsely toothed margins. The flowers are 6-8 millimeters (mm) long, with a four-lobed corolla about 5 mm diameter; they are produced in whorls around the stem, forming thick, blunt spikes. Flowering is from July to September. Peppermint belongs to the Lamiaceae family of the flowering plants. It is a natural hybrid of Mentha spicata (spearmint) and Mentha aquatica (watermint) and occasionally is found wild with its parent species in central and southern Europe. 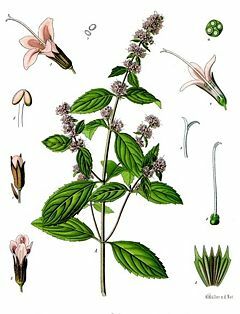 The first intentional crossbreed of watermint and spearmint was done in England. Being sterile, it spreads by rooting. The Mentha genus, known as mints, includes about 25 species. Mints are aromatic, almost exclusively perennial, rarely annual, herbs. The essential oil of peppermint includes the principal active ingrediants of menthol, menthone, and menthyl acetate, with menthyl acetate responsible for the plants minty aroma and flavor (Longe 2005). Menthol, the main active ingrediant, is found in the leaves and flowering tops of the plant and provides the cool sensation of the herb (Longe 2005). The quality of the oil is based on the menthol content. Japanese peppermint oil typically contains 85 percent menthol, while English peppermint oil has a menthol content of 60-70 percent and American 50-78 percent (Longe 2005). Peppermint flowers are large nectar producers and honeybees as well as other nectar-harvesting organisms forage them heavily. A mild, pleasant varietal honey can be produced if there is sufficient acreage of plants. Peppermint was first cultivated in England in the late seventeeth century (Longe 2005). It is primarily cultivated for its oil, which comes from the leaves, but the medicinal parts are derived from the whole plant and also include flavonoids, phenolic acids, and triterpenes (Longe 2005). The plant is harvested when it has its highest oil content, generally before the plant blooms, or during dry, sunny weather (Longe 2005). It is harvested in the morning before the essential oil content is reduced by the sun (Longe 2005). The United States is responsible for about 75 percent of the world's supply of peppermint. In the United States, Washington ranks number one in production of peppermint oil (OFM 2006). The wild form of the plant is less suitable for this purpose, with cultivated plants having been selected for more and better oil content. Seeds sold at stores labeled peppermint generally will not germinate into true peppermint, but into a particularly poor-scented spearmint plant. The true peppermint might rarely produce seeds, but only by fertilization from a spearmint plant and contribute only their own spearmint genes (similar to female mules that have babies, contributing only their maternal horse genes). Peppermint generally thrives in shade and expands quickly by underground rhizomes. When grown in a private garden, if not planted in containers it can rapidly take over a whole garden. It needs a good water supply, and is ideal for planting in part-sun to shade areas. Peppermint oil is used for flavoring and medicinal purposes. The medicinal use traces to Ancient Egypt, where it was used as a remedy for indigestion, and dried peppermint leaves have been found in Egyptian pyramids dating to 1000 B.C.E. (Longe 2005). Peppermint is one of the most popular flavoring agents, used as a flavoring in tea, ice cream, confectionery, chewing gum, mouthwash, and toothpaste. It is the oldest and most popular flavor of mint-flavored confectionery. Peppermint can also be found in some shampoos and soaps, which give the hair a minty scent and produce a cooling sensation on the skin. It is also used for flavoring in medicines, such as cough drops. It is found in perfumes, lipsticks, and other cosmetics. Peppermint, like many spices and herbs, is believed to have medicinal properties when consumed. It is used to treat ailments of the digestive system, skin, circulatory system, respiratory system, and nervous system (Longe 2005). It is said that it helps against upset stomachs, inhibits the growth of certain bacteria, and can help soothe and relax muscles when inhaled or applied to the skin. Other health benefits are attributed to the high manganese, vitamin C and vitamin A content; as well as trace amounts of various other nutrients such as fiber, iron, calcium, folate, potassium, tryptophan, magnesium, omega-3 fatty acids, riboflavin, and copper. Peppermint is used as a tincture, tea, an essential oil, oil capsules, and tablets (Longe 2005). Headaches. The pain-relieving effect of peppermint on [[headaches has been known for many years, with the first documented report published in 1879 (Longe 2005). A double-blind study revealed that an ethanol solution with 10 percent peppermint oil was as effective in releaving headache pain as 1000 mg of acetaminophen. When applied to the skin, such as rubbed on the temples, across the forehead, or behind the back, it is considered to ease digestive-related headaches and migraines by reducing sensitivity, cooling the skin, and relaxing the muscles (Longe 2005). Digestion aid. Peppermint has been used for thousands of years for ailments of the gastrointestinal tract. Among ailments treated have been irritable bowel syndrome, Crohn's disease, diverticulitis, diarrhea, gas, bloating, cramps, heartburn, colic, loss of appetite, and liver and gallbladder complaints (Longe 2005). Some trials have demonstrated that peppermint oil has the ability to reduce colicky abdominal pain due to irritable bowel syndrome (IBS), but the oil is irritant to the stomach in the quantity required and therefore needs wrapping for delayed release in the intestine. Respiratory ailments. As an expectorant and decongestant, peppermint is used to treat such respiratory ailments as asthma, bronchitis, sinusitis, and coughs (Longe 2005). It is used in cough medicine not only as a flavoring, but because of its effectiveness in easing coughs. Other medical uses. Peppermint is used in treating stress, nervous insomnia, anxiety, and restlessness, as well as ued to relieve muscle pain, itching, and fungal infections (Longe 2005). It is used to bring down fevers, as an antiseptic, in treating bad breath and sore throats, and preventing tooth decay and gum disease (Longe 2005). It is considered to have antiviral properties, and thus can be used to fight viruses such as influenza, herpes, yeast infections, and mumps, and is used as an earache remedy and to dissolve gallstones, and ease muscle tightness and menstrual cramps (Longe 2005). The medicinal effects are provided in various manners. For example, peppermint tea is used in relieving migraine headaches, minor colds, digestive ailments, and morning sickness (Longe 2005). The essential oil may be used in over-the-counter balms and liniments that can be applied externally to relieve muscle pain, arthritis, itching, and fungal infections (Longe 2005). The oil may be inhaled as aromatherapy to reduce fever, relieve nausea and vomiting, improve digestion, and sooth the respiratory system (Longe 2005). Longe, J. L. 2005. The Gale Encyclopedia of Alternative Medicine. Farmington Hills, MI: Thomson/Gale. ISBN 0787693960. Office of Financial Management (OFM), State of Washington. 2006. 2005 Data Book: Washington's rank in the nation's agriculture. Access Washington. Retrieved July 19, 2007. Siegel-Maier, K. 1998. Peppermint: More than just another pretty flavor. Better Nutrition (February 1998): 24. This page was last modified on 30 December 2008, at 13:10.